During the first half of 2013, ULAS carried out an intermittent inspection of extensive groundwork in the historic south-east quarter of medieval Coventry during the installation of the city’s new district heating system pipeline. Although Lady Godiva remains elusive, slight archaeological remains dating from the medieval period through to the 19th century were observed in several different locations throughout the work, on Whitefriars Lane, Grove Street, Cox Street, Jordon Well and London Road; whilst the discovery of a complex sequence of medieval and post-medieval archaeology on Much Park Street and around Whitefriars Gateway led to a small phase of excavation. Plan showing the route of the pipeline trench. Lines in green show where areas of archaeology survived. Part of a medieval building is excavated on Whitefriars Lane. Significant early medieval evidence was revealed beneath Much Park Street. Just north of Whitefriars Gateway a length of cobbled surface was found close to a meter beneath the modern road level. Given its depth, it may date to the early medieval period, perhaps the 12th century when this area lay outside the early town in Cheylesmore Park, an estate of the earl of Chester. This cobbled track may be an early precursor of Much Park Street. At least one building of 12th to 14th century date was found close to Whitefriars Gateway. This was stone-walled with clay floors and appeared to be aligned with the frontage of Much Park Street. From the 13th century, Much Park Street developed into a major thoroughfare to London and this building is comparable with the ‘Stone House’, the ruin of a 14th century mercantile house still visible 50m to the north. In 1342, the Carmelites (commonly known as White Friars) established their friary at the end of London Road. ‘Whitefriars’ expanded throughout the 1340s and in 1352 they acquired land off Much Park Street to create a (still standing) gateway – ‘Whitefriars Gateway’. The friary’s precinct wall in this area is presumed to run east to west along either side of Whitefriars Lane; and a substantial stone wall, nearly 2m wide, recorded running parallel with the north site of the lane may well be part of this boundary. By the 15th century the friary precinct stretched west from the River Sherbourne to Much Park Street and north from New Gate to Gosford Street. The friary once had a substantial church, c.95m in length, and the eastern end is still visible beyond the ring road; but the only surviving building is the eastern cloister with the friar’s dormitory. This dates to the later 14th century and was later used as a private house by the Hales family after the dissolution before being converted into a workhouse for the poor in the 19th century. Archaeological deposits and a stone wall observed along Whitefriars Lane are all formerly within the north-western corner of friary precinct but evidence is so fragmentary that little further can be said. A block of carved stone recovered from the demolition rubble of the town wall. South of the friary, work carried out within the traffic island on London Road revealed evidence for a large, demolished wall, believed to be part of the town wall which was built in stages from the 14th century. Pottery and tile recovered from surrounding deposits dates from the 14th century, which is in keeping with this construction date. The wall varied in width from 2.1m to 2.4m and although no surviving in situ wall fabric survived at London Road, the width of the foundation trench was 3.1m. Fine ashlar blocks were found amongst the demolition rubble suggesting the wall was finely constructed but it appears to have had little in the way of foundations. Evidence suggests it was demolished during the 17th century. The stone well found beneath the Whitefriars Ringway. Elsewhere, north of Gosford Street beneath the Whitefriars Ringway fly-over, a stone-lined well was discovered. This was beautifully constructed from shaped red sandstone blocks and was therefore thought to be associated with a property of some wealth formerly fronting onto Gosford Street. Probably originally of medieval date, it had remained in use as late as the 19th century before being sealed off. 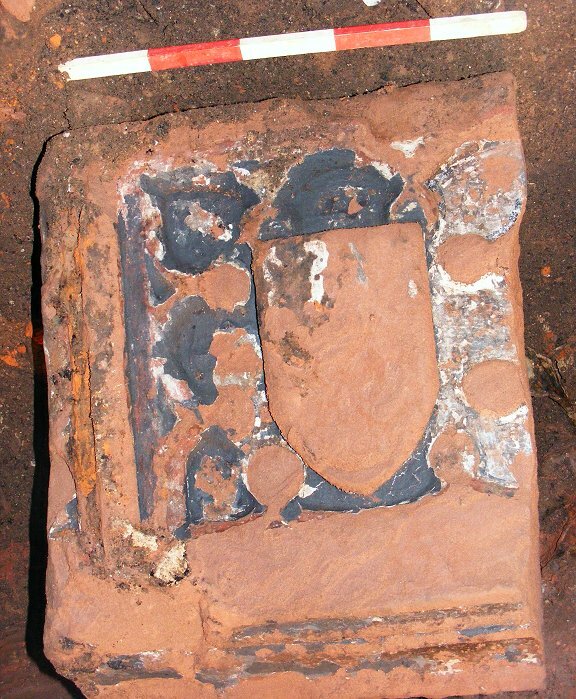 Piece of decorated frieze found capping a well. One of the more intriguing discoveries of the project was unearthed when the capping stones were removed. These were large fragments of sandstone, all originally part of the same piece, and on lifting it could be seen that they were highly decorated on one side with a series of octo-foiled panels and shields in the style of the famous London/Court architect, Henry Yeveley (c.1360-1400). Erosion and sooting imply that the pieces were originally mounted outdoors and it is probable that they a part of a late 14th century horizontal frieze, perhaps mounted above a gatehouse passage arch. In several locations (Jordan Well, Much Park Street), the assimilation and re-sue of medieval walls and boundaries was seen, with the older stonework partially truncated by or adjacent to more modern brickwork. The trenches also revealed evidence for 19th century occupation and industrial use, in the form of brick footings, culverts and a brick well or soakway and surface on Priory Street, in an area which had previously been a timber yard. Garden soils and modern backfills were also widely observed along the pipeline route. Overall, most of the trenches were excavated through ground which had been previously been disturbed and backfilled with modern debris. However, several ‘pockets’ of surviving archaeology were located, dating from the medieval and early post-medieval periods and including important evidence for medieval buildings in several locations close to Much Park Street and Whitefriars Lane. ULAS would like to thank Cofely District Heating who financed the work. Previous Post King Richard III Identity: CASE CLOSED AFTER 529 YEARS!